The Gallipoli Campaign of 1915-16, also known as the Battle of Gallipoli or the Dardanelles Campaign, was an unsuccessful attempt by the Allied Powers to control the sea route from Europe to Russia during World War I. The campaign began with a failed naval attack by British and French ships on the Dardanelles Straits in February-March 1915 and continued with a major land invasion of the Gallipoli Peninsula on April 25, involving British and French troops as well as divisions of the Australian and New Zealand Army Corps (ANZAC). Lack of sufficient intelligence and knowledge of the terrain, along with a fierce Turkish resistance, hampered the success of the invasion. By mid-October, Allied forces had suffered heavy casualties and had made little headway from their initial landing sites. Evacuation began in December 1915, and was completed early the following January. 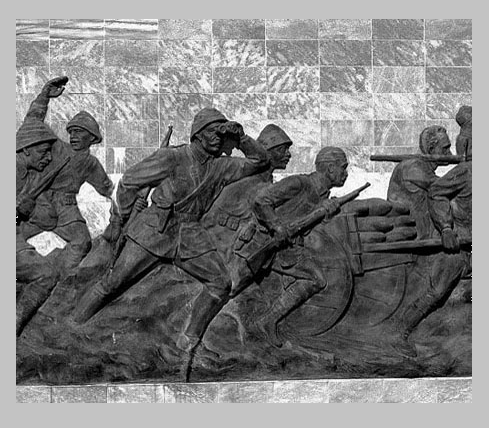 The Gallipoli Campaign, also known as the Dardanelles Campaign, the Battle of Gallipoli or the Battle of Çanakkale (Turkish: Çanakkale Savaşı), was a campaign of World War I that took place on the Gallipoli peninsula (Gelibolu in modern Turkey) in the Ottoman Empire between 25 April 1915 and 9 January 1916. The peninsula forms the northern bank of the Dardanelles, a strait that provided a sea route to the Russian Empire, one of the Allied powers during the war. Intending to secure it, Russia’s allies Britain and France launched a naval attack followed by an amphibious landing on the peninsula, with the aim of capturing the Ottoman capital of Constantinople (modern Istanbul). The naval attack was repelled and after eight months’ fighting, with many casualties on both sides, the land campaign was abandoned and the invasion force was withdrawn to Egypt.With Allied casualties in the Gallipoli Campaign mounting, Hamilton (with Churchill’s support) petitioned Kitchener for 95,000 reinforcements; the war secretary offered barely a quarter of that number. In mid-October, Hamilton argued that a proposed evacuation of the peninsula would cost up to 50 percent casualties; British authorities subsequently recalled him and installed Sir Charles Monro in his place. By early November, Kitchener had visited the region himself and agreed with Monro’s recommendation that the remaining 105,000 Allied troops should be evacuated. The British government authorized the evacuation to begin from Sulva Bay on December 7; the last troops left Helles on January 9, 1916. In all, some 480,000 Allied forces took part in the Gallipoli Campaign, at a cost of more than 250,000 casualties, including some 46,000 dead. On the Turkish side, the campaign also cost an estimated 250,000 casualties, with 65,000 killed. What some people don’t know is that all the men who fought during the eight-month battle at Gallipoli, including the 8,000 who died, were all volunteers. In other countries, soldiers were drafted (there was a mandatory sign-up) to fight in the war. Originally, the term ‘ANZAC’ was used to mean any soldier who was a member of the army corps that fought at Gallipoli. While typically thought of as just Australian and New Zealand nationals, the ANZACs included officers from India, Ceylon, the Pacific Islands, England and Ireland. However, the term has subsequently been broadened to mean any Australian or New Zealander who fought or served in the First World War. A soldier named Alec Campbell was the last surviving ANZAC. He died on 16 May, 2002. The most significant time to remember the ANZACs is at dawn, as this is when the original Gallipoli landing occurred. The dawn service was first started by returned soldiers in the 1920s and originally, dawn services were only attended by veterans. Today, anyone can attend a service. One of the key reasons for the failure of the Gallipoli offensive was the fact that the boats carrying the Australian and New Zealand soldiers landed at the wrong spot. Instead of finding a flat beach, they faced steep cliffs, and constant barrages of fire and shelling from the Turkish soldiers. While the battle itself was a crushing defeat, the Australian and New Zealand soldiers were relentless and displayed incredible courage and endurance, even despite the most horrible of circumstances. This is how the ANZAC legend was born. The Gallipoli battle itself ended in a stalemate, when the ANZACs retreated after eight months of battle. The ANZAC spirit is wonderfully represented by a brave man – Private John Simpson Kirkpatrick. He was a stretcher bearer in the Australian Army Medical Corps, and spent his nights and days rescuing injured men from the battle lines in Monash Valley. He transported them back to the safety of ANZAC cove on his donkey. He is thought to have rescued over 300 wounded soldiers. Another man who epitomised the ANZAC spirit was Charles Billyard-Leake. In 1914, he was living in a large manor in the UK – which he turned into a hospital for ANZAC soldiers. During the war, and for a while afterwards, over 50,000 Australians stayed at this Harefield Hospital. The Last Post was typically played during war to tell soldiers the day’s fighting had finished. At memorial services, it symbolises that the duty of the dead has finished, and they can rest in peace. ANZAC biscuits were believed to have made an appearance during the Gallipoli offensive. Made of oats, sugar, flour, coconut, butter and golden syrup, they were hard and long-lasting, and were ideal for troops in the trenches. They were apparently eaten instead of bread. Professor Frame said the Anzac dawn service is unique to Australia, and adds another layer to what it means to be Australian. Dr Knapman said the tradition belongs to all Australians. He said dawn services popped up around the country and there may be some which have gone unreported. Dr Knapman said towns across the country holding ceremonies demonstrated the dawn service was a popular tradition which was not forced on communities from the top down, but spread from the bottom up.